This time we will share information to cool you lovers of automotive and mechanics. We will introduce the 2 best scanner from each brand. What is it scanner is? A scanner is a device that serves to detect damage to the injection system of the car, in addition to the code can detect damage and remove code breakage, this tool can also display live data streams of cars. We can see information such as code injection of car’s system that can damage engine, gauges, temperature sensor, engine, etc. This tool is very helpful, especially for riders who like to travel far, this tool as an Assistant to monitor problem in car’s machine. Then, what brand will be shown? Please enjoy Launch X 431 vs Snap on D10. Snap On D10 is an equitable solution claims to be shifting the maintenance until 100% in-house program. This makes sense enough as it obviously costs less than with new tool investments. And we have completed control over the quality of workmanship performed on some equipment. When it comes to high-end scan and diagnostic tools, there are some things to choose from. 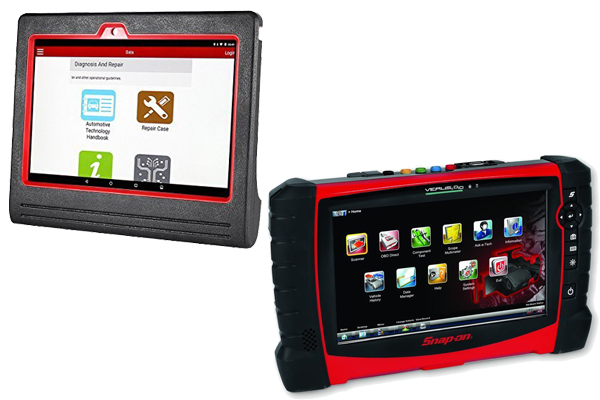 The Snap On D10 Edge will store and manage an amount of vehicles in its database and also provides exclusive expert resources such as SureTrack, Troubleshooter and Fast-Track Guided Component Tests. Fast track Guided component tests is the most excellent features that will show you how and where to test components and what results you should be getting in order to verify failed parts before replacing them. While the others like SureTrack is the automotive industry’s most comprehensive source of expert knowledge, it consists of a lot successful completed repair orders from many technicians verified real fixed outlining parts replacement records. The last one is troubleshooter. It covers everything from trouble code tips, symptom tips and even time saving advice. First of all before you decide a choice, you must determine which carws you work on. Actually, we will totally recommend you with the Launch X431 not only because of its affordable price, but also for the features and good reviews among it. What is wrong with Snap On D10? They sometimes must take minutes to boot up and load all its fancy graphics, you will not like it.